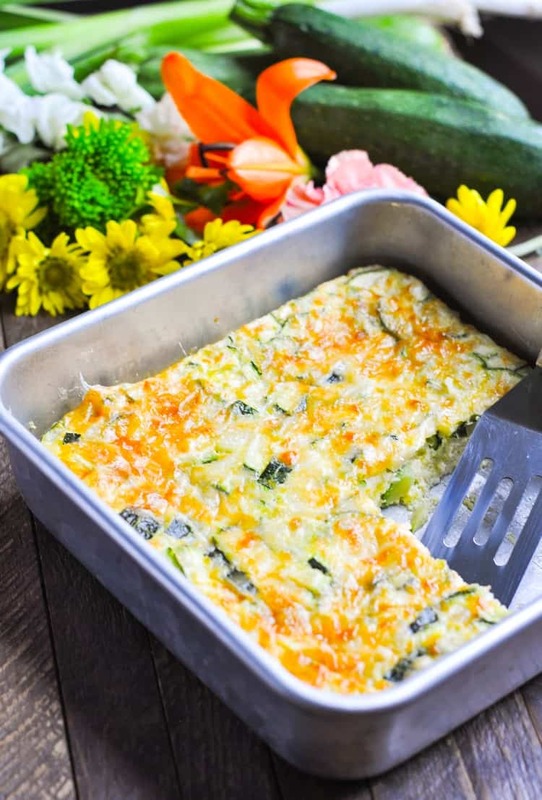 Enjoy all of the delicious, fresh zucchini from your garden in a simple and healthy Zucchini and Parmesan Baked Omelet -- plus a handful of other quick and easy zucchini recipes! This easy egg casserole is a quick prep-ahead breakfast, brunch, or dinner for the warm summer months! 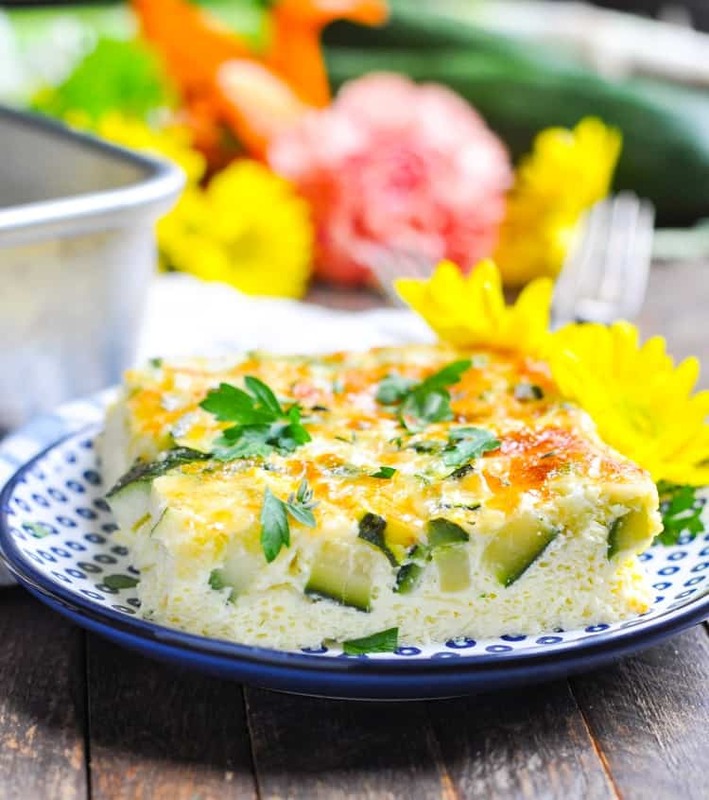 Enjoy all of the delicious, fresh zucchini from your garden in a simple and healthy Zucchini and Parmesan Baked Omelet — plus a handful of other easy zucchini recipes! This easy egg casserole is a quick prep-ahead breakfast, brunch, or dinner for the warm summer months! Who doesn’t love a light, fluffy omelet?! But they’re kind of like pancakes — the end result is great, but the process can feel tedious. Standing at the stove flipping omelet after omelet to feed my hungry family is NOT my idea of a good time. I never quite get the flip right, the fillings fall out, it’s not cooked through the center, or I just end up with a pile of scrambled eggs! 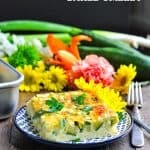 When I was looking for some new zucchini recipes to enjoy the season’s produce, I instantly thought of adding them to one of my beloved baked omelets. Regular readers know that my Ham and Cheese Baked Omelet and my Baked Western Omelet have been some of my favorite go-to brunch recipes for years. They only require a few minutes to stir together, and then I pop the dish in the oven and my job is done. It’s such an easy and healthy way to serve eggs to a large group without micromanaging a skillet! 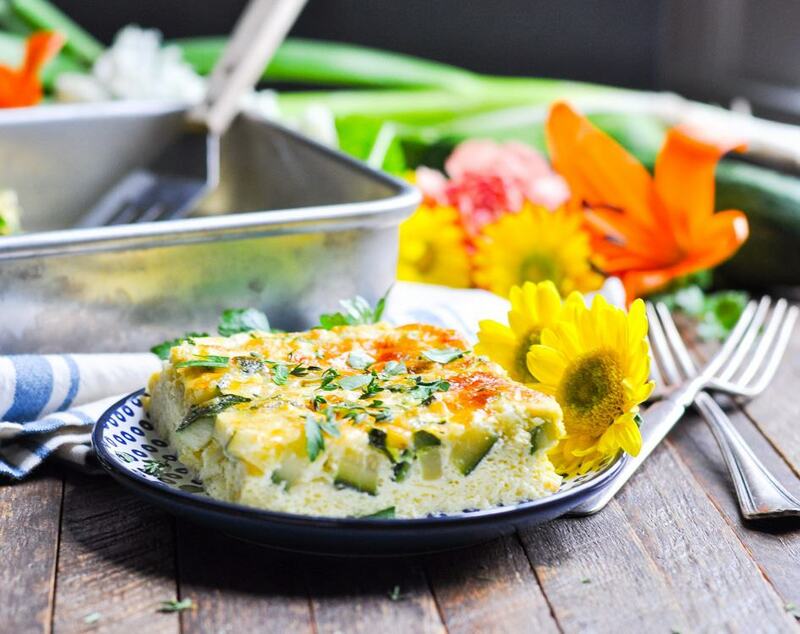 The flavors in this particular omelet were inspired by my classic Zucchini Pie. This is just a lighter version of that dish, and it’s equally versatile. You can enjoy my baked omelet warm out of the oven for brunch; bake it in advance and eat it at room temperature for supper with a side salad and toast; or keep it in the refrigerator and reheat it for breakfast on busy weekday mornings! 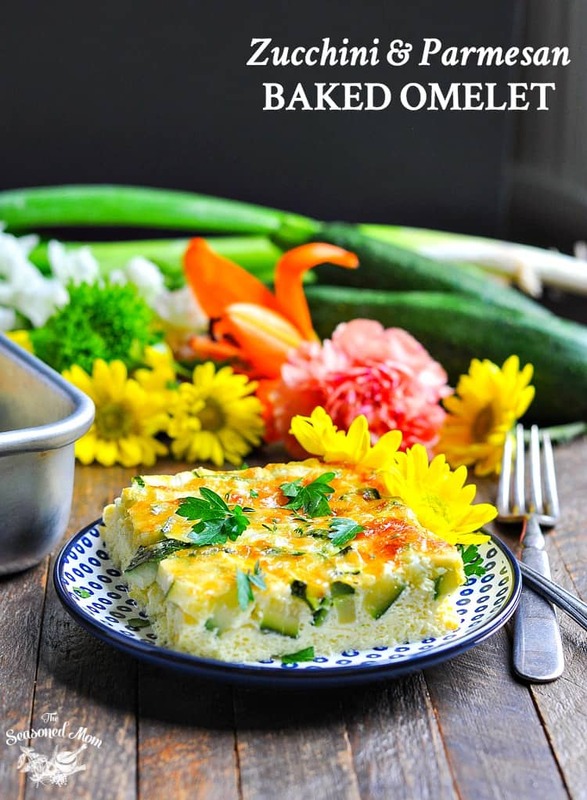 If you’ve tried this Zucchini and Parmesan Baked Omelet or Any Of the Easy Zucchini Recipes then don’t forget to rate the recipe and leave me a comment below! You can also follow me on Facebook, Twitter, Instagram and Pinterest to see what I’m getting up to. Heat oil in a large skillet over medium-high heat. Add zucchini and onion and cook, stirring regularly, until tender (about 5-7 minutes). Meanwhile, whisk together eggs, milk, and seasoned salt in a large bowl. Stir in cooked zucchini, onion, and ¼ cup of Parmesan. Pour egg mixture into a greased 8-inch-square baking dish. Sprinkle remaining ¼ cup of Parmesan on top. Bake at 350F/180C for 40-45 minutes, or until eggs are cooked and omelet is set. Cut into squares and garnish with fresh herbs, if desired. Cooking Just for Two? You can cut these ingredients in half and bake in individual ramekins or in a small gratin dish. Cooking time will be 35-40 minutes. Want to Prep Ahead? You can bake this omelet in advance and keep it in the refrigerator until ready to serve. Slice and reheat individual portions in the microwave for 30-60 seconds, or in the oven or toaster oven until heated through. It also tastes great at room temperature! Previous Post: « Our Week in Meals #37 + a BIG Bummer! I love the idea of a baked omelet! I hate flipping them too, and am not good at it, so this baked version sounds wonderful! And what a great way to use up all of that zucchini I have lying around. This sounds delicious! This is a great idea for when my adult kids and grandkids spend the weekend. We always have a leisurely breakfast together. I like this low carb idea that I could make in advance and bake that morning.. It would free me up and take away some of the stressful individual omelette making. Yummm! I love baked egg dishes and this looks so tasty! Thanks, Kristy! It’s definitely a keeper! If you hit the print button that’s located on the page (where the actual recipe is) it should only be 2 pages. Hope this helps! It’s yummy. First thing, you place such nice images. It talks more than words. I cant wait to follow your instruction. 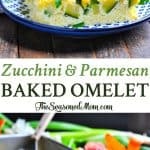 I will definitely try Zucchini and Parmesan Baked Omelet. Thanks to share. I love how easy this is to make and thanks for sharing more recipes with zucchini!